Modern City apartments in the heart of Innsbruck with every comfort - Appartement "Hafelekar"
The kitchen area is high quality and fully equipped with stove, oven, refrigerator, dishwasher, coffee machine, full equipment kitchen utensils and crockery. Coffee, tea, sugar, spices, vinegar and oil are available free of charge at their disposal. The bedrooms have double king size beds made of natural wood with reading lamps, dressing tables, each with Flatsreen TV, Wi-Fi - or Cable Internet access for free - some with walk-in closets. Each spacious bathroom with sink, large bath with a shower curtain and washing machine including washing powder. Sport and Leisure: Let them be inspired by the sports city of Innsbruck and use them the varied recreational activities. Skiing and cross-country skiing, tennis, football, golf, inline skating, swimming, bobsled, ski jump Bergisel and much more. From the apartment the new Hungerburgbahn the star architect Zaha Hadid with a connection to the Alpinarium North Park (ski arena) at 2256m above sea level in only 7 minutes walking distance. Culture and Music: Take advantage of the diverse cultural and musical highlights of the state capital, such as Imperial Palace, Cathedral of St.. Jakob, Museum Golden Roof, Ambras Castle with Castle Park, Alpine Zoo, and ... Dance Summer Innsbruck, State Theatre Innsbruck, Innsbruck Festival, greenhouse, ... and much more. From the entrance area with its wall wardrobe and shoe box, you can reach the toilet room and a spacious bathroom with sink, large bath with shower screen and washing machine. This is an absolutely mint condition design apartment which was opened in May 2011. The equipment is completely lifted and exquisite. 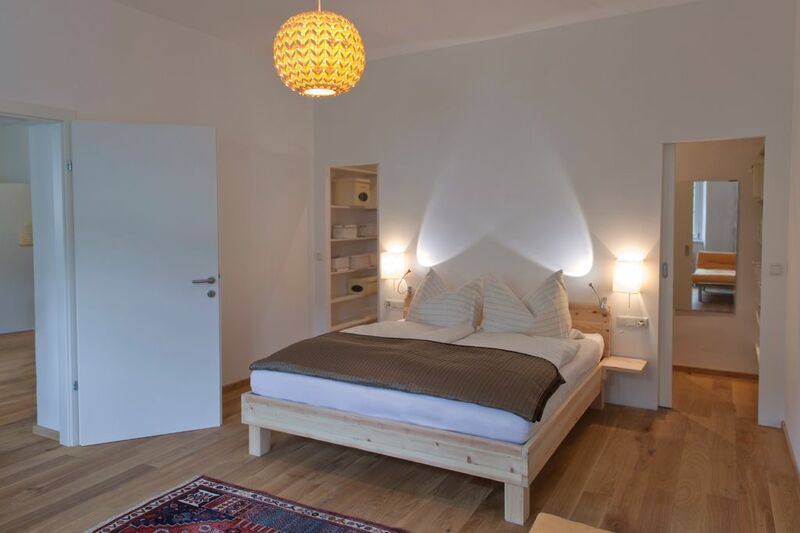 Oak flooring natural brushed and oiled Zirbenholzbetten, modern kitchen with full facilities, bathrobes, separate room service on request, private garage parking, washing machine, 3 TV flat screens, full internet in every room, bathroom and toilet. , , 5 City Bicycles are available for free for you. Practical and comfortable and perfect Innsbruck location. Super apartments rented by Gerhard but the reservation process is confusing. The picture on this review, of a two bedroom apartment, is of the 2 BR that was advertised and that we intended to rent. We received an email response (with this same picture and property number) saying we could confirm the reservation with a credit card payment. We made the payment. A few days before the trip I grew concerned that I had not received access information. I pulled up the email and saw that the response, in less highlighted print, had actually said that the apartment was not available but there were two smaller 2 bedrooms the same owner had available. I called HomeAway, they reviewed the reservation and assured me I was confirmed for the original 2 bedroom. I then called the owner to get access information but he told me I had actually reserved one if his other (that are actually one bedroom) apartments that are technically under the same property number??? This was news to the HomeAway customer service folks but I was past the refund deadline. The great news is that the owner stepped up and threw in a second one bedroom for a nominal fee. The bottom line is that all three of the apartments rented by Gerhard are fabulous and, considering another review also highlights the same confusion, I am sure he will move them to separate property numbers going forward. We were given a different apartment then shown in the pictures. We rented a 2 bedroom apartment and given a 1 bedroom and a make shift bed on the couch for my daughter. Also we could not use the freezer because it was full of fish and smelled every time you opened the refrigerator. The apartment was clean and very close to all you need in Innsbruck. This property was beautiful and spacious, and located perfectly next to old town Innsbruck. The owners were so nice and helpful. The apartment is 100% quiet at night. I would absolutely recommend this apartment if you plan to visit Innsbruck. A great apartment that is close to all the action! I'd definitely recommend to my family and friends! The best part is for a family with children. The apartment has a lot of fun quality toys, a baby bath tub, a baby potty seat, and more!! Very convenient and walking distance to everywhere . We throughly enjoyed our 2 week stay at this apartment! We chose the smaller 1 bedroom, it had all we need and more. Being on the quieter and older side of the river was perfect, and we still had easy access to the Alstadt, public transportation, and many delicious restaurant (including the bakery, Indian, and Tirol places Gerhard recommended). But the views through the windows were our favorite part! As my husband had a perfect view as he "telecommuted". The little chair was my favorite place to relax and read, turning to see how the mountain changed. Memories we have will bring warm feelings of our time in Innsbruck and our cozy home away from home. In our five modern city apartments located in the quiet and super central location perfect setting for your stay in Innsbruck. Located right on the Inn nestled in the picturesque setting of historic Mariahilfplatz and just a five minute walk all known city landmark - The Golden Roof, the Imperial Palace and the Maria Theresa Street are just a few steps away and make cultural excursions into Heart of the Alps pleasure. Summer and winter, art and culture, shopping and sightseeing, sports and leisure activities or just relax and unwind. In the immediate vicinity are all the facilities of modern life such. B. Shopping and catering facilities, cafes and restaurants, shopping and dining street, universities, State Theatre, the marketplace and the market hall Innsbruck with its range of farm products and the Kaufhaus Tyrol. You do not necessarily have to be home to feel at home. In our five apartments you find everything necessary to make your stay as relaxing as possible: in addition to free Wi-Fi our users are also bicycles for hire are available. In addition there is coffee (Nespresso), tea, spices, vinegar and oil for free for the taking. Also included are fresh towels, bathrobes, linens, soap and detergent, and the final cleaning after your trip. Our parking garage, you can always use a flat rate and on request we can provide a baby cot. Weitere Einzelpreise und Pauschalen für Langzeitaufenthalte sind auf Anfrage individuell möglich. Preise verstehen sich inkl. aller Steuern (USt,...) und , Flatscreen TV und ENDREINIGUNG! Privater Garagenabstellplatz im Haus kostet pro Tag € 18,- . Das Appartement liegt in der gebührenpflichtigen Kurzparkzone!